The (printed) ‘Updated Edition’ now comes with added value access to the complete, downloadable eBook version via Student Consult. Search, read and revise whilst on the move and use the interactive self-assessment to test your understanding. Crash Course – a more flexible, practical learning package than ever before. Crash Course – your effective every day study companion PLUS the perfect antidote for exam stress! Save time and be assured you have all the information you need in one place to excel on your course and achieve exam success. A winning formula now for over 15 years, each series volume has been fine tuned and fully updated, with an improved layout tailored to make your life easier. Especially written by senior medical students or recent graduates – those who have just been in the exam situation – with all information thoroughly checked and quality assured by expert faculty advisers, the result are books which exactly meet your needs and you know you can trust. 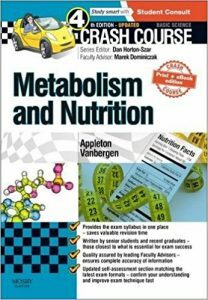 This volume explains the essential concepts of human metabolism and nutrition in a memorable, easy-to-understand format. Complex information is provided succinctly and is accompanied by a full artwork programme making an often challenging subject very accessible. 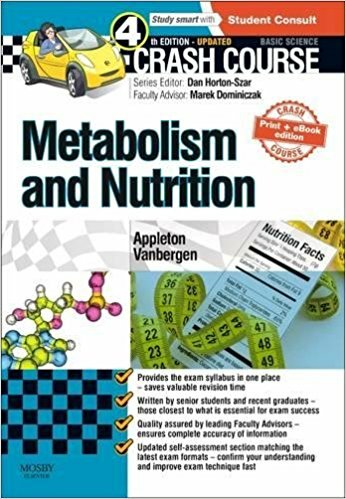 A full discussion of metabolic diseases then adds relevance to the underlying concepts while clinical assessment and examination, common skills and further investigations complete the picture. A fully revised self-assessment section matching the latest exam formats is also included to check your understanding and aid exam preparation. Provides the exam syllabus in one place! Written by senior medical students or junior doctors – authors who really understand today’s exam situation! Senior Faculty Advisors ensure complete accuracy of the text! Full artwork programme, improved ‘Hints and Tips’ boxes, and ‘Clinical Application’ boxes help you remember the key points! Self-Assessment section – fully updated to reflect new curriculum requirements – helps you maximise your grade! Solid, accurate, user-friendly coverage provides enough detail even for those aiming at distinction! Crash Courses also available electronically! Online self-assessment bank also available – content edited by Dan Horton-Szar! Now celebrating over 10 years of success – Crash Course has been specially devised to help you get through your exams with ease. Completely revised throughout, the new edition of Crash Course is perfectly tailored to meet your needs by providing everything you need to know in one place. Clearly presented in a tried and trusted, easy-to-use, format, each book in the series gives complete coverage of the subject in a no-nonsense, user-friendly fashion. Commencing with ‘Learning Objectives’, each chapter guides you succinctly through the topic, giving full coverage of the curriculum whilst avoiding unnecessary and often confusing detail. Each chapter is also supported by a full artwork programme, and features the ever popular ‘Hints and Tips’ boxes as well as other useful aide-mémoires. All volumes contain an up-to-date self-assessment section which allows you to test your knowledge and hone your exam skills. Authored by students or junior doctors – working under close faculty supervision – each volume has been prepared by someone who has recently been in the exam situation and so relates closely to your needs. So whether you need to get out of a fix or aim for distinction Crash Course is for you! !